You spent months researching and comparing cameras and lenses before you finally decided on the camera of your dreams. So, what is the next big step in your photography journey? Before you snap your first picture, it’s important to have a reliable memory card to aid and enhance your sophisticated photography equipment. A memory card can truly make or break your entire photography experience. Choosing the right memory card may seem like a trivial task, but it can be confusing since there are so many choices on the market. As an ex Canon photographer and educator, one of the most common questions I get is “What is the best SD memory card for a Canon Rebel t5, t6, or t7? Canon is the kind in the field of DSLR technologies and affordability. This is why the Canon i5 and now i6 are ranked as the most purchased DSLR camera on Amazon. It is also one of the most popular entry level cameras on the market! From my personal experience shooting with the Canon cameras, I recommend these SD memory cards. To learn more about the reasoning behind my selections, keep reading! People usually make two common mistakes when they purchase an SD card for their Canon Rebel. They either buy a memory card that is far too slow or they overspend on a memory card that the Rebel does not support. Both mistakes result in a lot of frustration. Type – The card must be compatible with your camera. Speed – The card must match the speed of your camera. Size (Storage Capacity) – The card must be large enough to store thousands of images. Reliability – The card must perform well. Let’s address each of these factors. The easiest item to check off the SD card selection process is type. Why? All the information on compatible SD cards for your camera is listed in your camera’s user guide. Simple enough! The difference between these three storage types is that the original SD (Secure Digital) has a capacity limit of 2GB. The next generation SDHC (Secure Digital High Capacity) supports a volume capacity of up to 32GB. The latest version of the SDXC (Secure Digital eXtended Capacity) has an increased card capacity of up to 2TB. SD (Secure Digital) – This card has a capacity limit of 2GB. 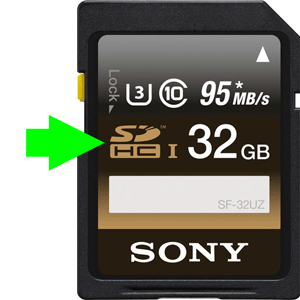 SDHC (Secure Digital High Capacity) – This card has a capacity limit of 32GB. 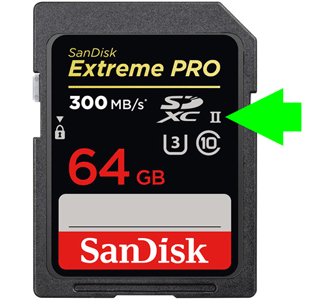 SDXC (Secure Digital eXtended Capacity) – This card has a capacity limit of 2TB. It is almost guaranteed that if you buy an SD memory card for your Canon Rebel today, it will be the SDXC type. Because you need the card with the storage capacity larger than 32Gb. 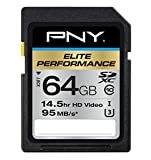 While selecting the right type of memory card is the easiest part of the process, determining the right speed of memory card is the most crucial and confusing. Let’s break it down. There are two speeds we need to focus on. The Write Speed is how fast the camera transfers photos to the memory card. This is vital in allowing photographers to shoot without interruption. The Read Speed is how fast the photos are transferred from the memory card to a computer or another device. This is important but it is less critical for photographers. 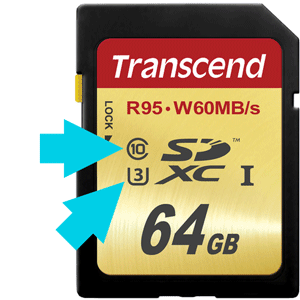 So, what makes selecting the right speed of memory card so confusing? 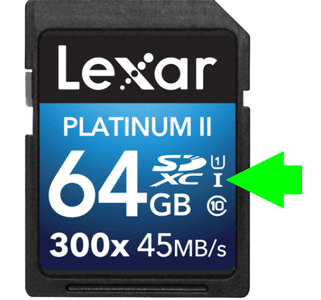 Almost all SD card manufacturers ignore the Write Speed and only specify the Read Speed on the card. Why? The Read Speed is always faster, which can be a little misleading. 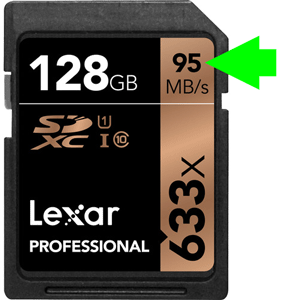 Almost all SD card manufacturers ignore the Write Speed and only specify the Read Speed on the card. The Read Speed is always faster, which can be a little misleading. To estimate the actual Write Speed of an SD memory card, we need to understand the Speed Class Ratings. The Speed Class Ratings help us match the card’s Write Speed to the maximum internal speed of the camera. Canon Users: Canon does not specify the camera’s maximum internal speed in any of the user guides. Various sources online and in the photography community estimate the speed around 30 MB/s for the Canon Rebel t5, Rebel t6, or Rebel t7 models. 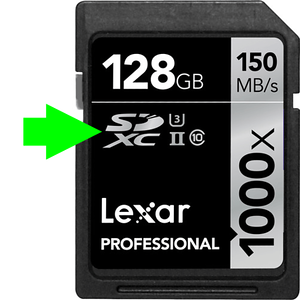 What does this mean in terms of SD cards? The Canon Rebel t5, Rebel t6, or Rebel t7 models cannot take advantage of the SD memory cards faster with a Write Speed faster than 30MB/s. In keeping with the topic of memory card speed, a new generation of SDXC cards featuring a faster bus speed was introduced a few years ago. The UHS-II cards feature new pin connections to sustain a faster bus speed. These new connections are visible on the back of both cards. 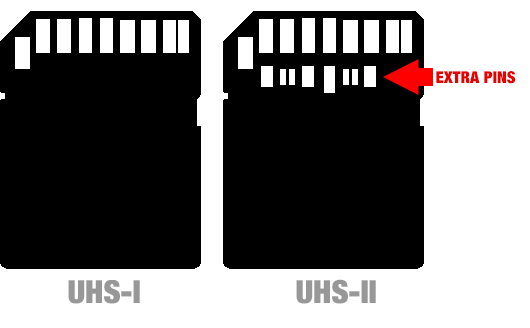 The UHS-I card features one row of pins and the UHS-II features two rows of pins. Important: While the UHS-II is great in terms of speed, the Canon Rebel t5, Rebel t6, or Rebel t7 models do not support USH-II format and as a result cannot take advantage of the faster Write Speed and will default to the UHS-I values. Summary: The most optimal SD memory card that takes full advantage of the Canon Rebels’s speed is an SDXC card, UHS-I type with a U3 speed class rating. Now that we understand type and speed, we look to memory card size or capacity. The size of the memory card is important to me as a travel photographer because I want to spend an entire day shooting without having to change memory cards. Depending on shooting conditions and camera settings, the Canon Rebel produce RAW files around 25MB and JPEG files between 5MB and 13MB. This makes it seem like a 32GB memory card would meet all my needs, but that is not the case. Why not? I usually shoot RAW+JPEG so that I can quickly edit the JPEG image with my phone or tablet. I also bracket my shots, which means I take anywhere between three and seven photos at a time. On a 32GB memory card, I can only store 276 bracketed shots. That is not enough room for my style of shooting. To summarize our selection: SDXC card, type UHS-I with U3 speed class rating and a 64BG or 128GB capacity. Reliability is the last piece of the SD memory card puzzle. It is also one of the easiest components since brands like SanDisk, Sony, Transcend, Fujifilm, Lexar, Kingston, and PNY offer reliable products. When buying an SD memory card online, avoid eBay or unknown online stores as well as suspicious manufacturers from Asia. If you prefer shopping on Amazon, ensure the product is sold and fulfilled by Amazon. It’s that simple! UHS-I SD memory cards compatible with Canon Rebel t5, t6, or Rebel models.